When Louis’ Scottish uncle sends him a tadpole as a birthday present (fresh from Loch Ness), it does not turn into a frog. It does, however, turn into a wonderful (if utterly impracticable) pet. Note: This version of the book is out of print. In 2004, a new version was issued with a revised text and all new illustrations. The changes were not an improvement. 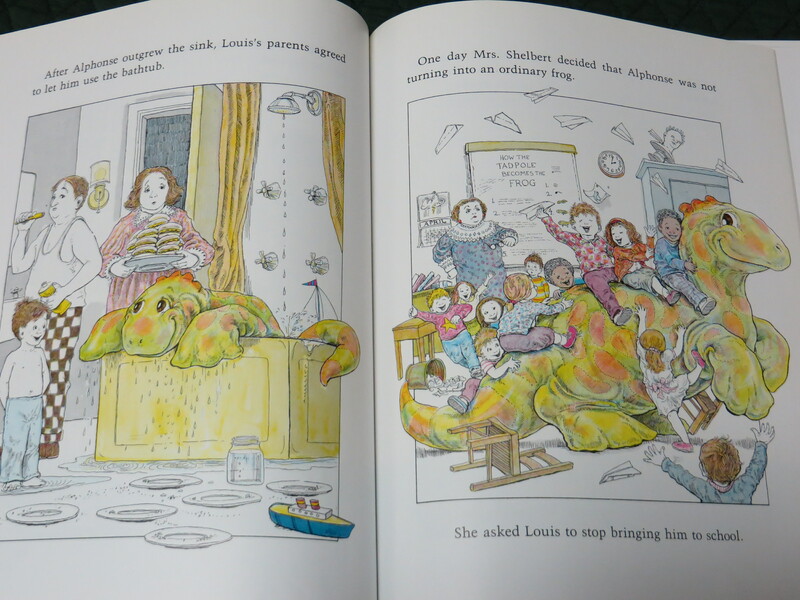 Look for the version of the book that has the “tadpole” gazing up at Louis in profile, rather than a straight-on view of them both. 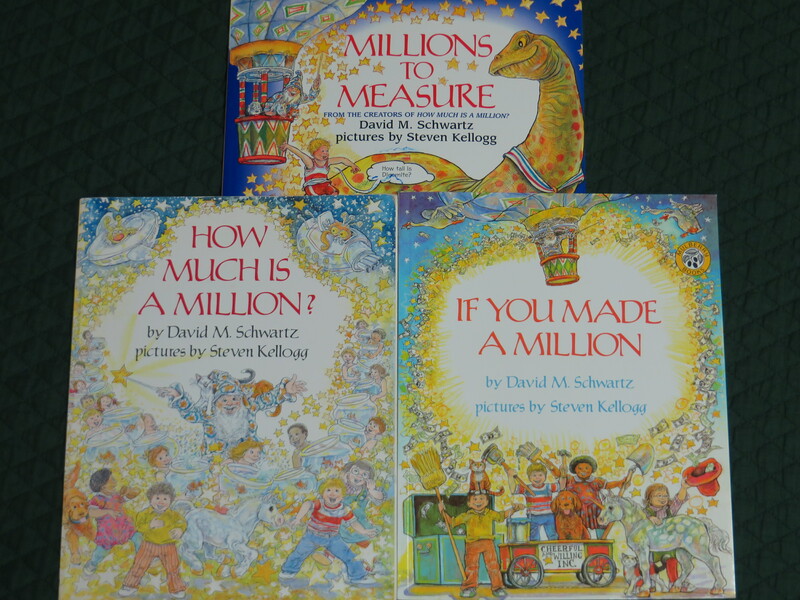 Visualizing a million, billion, or trillion (or other concepts like compound interest and the metric system) isn’t easy, unless you read this fun series of books. Steven Kellogg’s cheerful illustrations keep things light, bright, and engaging. How Much is a Million? is our favorite of the series. Barney Bipple is six, but he’d rather be eight. He’d also like a big, shiny car of his own and for his dog to be able to talk. One day he does a favor for his very well dressed next-door neighbor, who rewards him with three white, puffy dandelions. and furs. If you need more, just let me know. Now Barney can have everything he’s ever wanted. But things don’t turn out quite the way he expected in this playful book. Steven Kellogg’s pictures are sunny and fun (and give a very different tone to this book than Arnold Lobel’s work gave to the same author’s work in The Tale of Meshka the Kvetch). 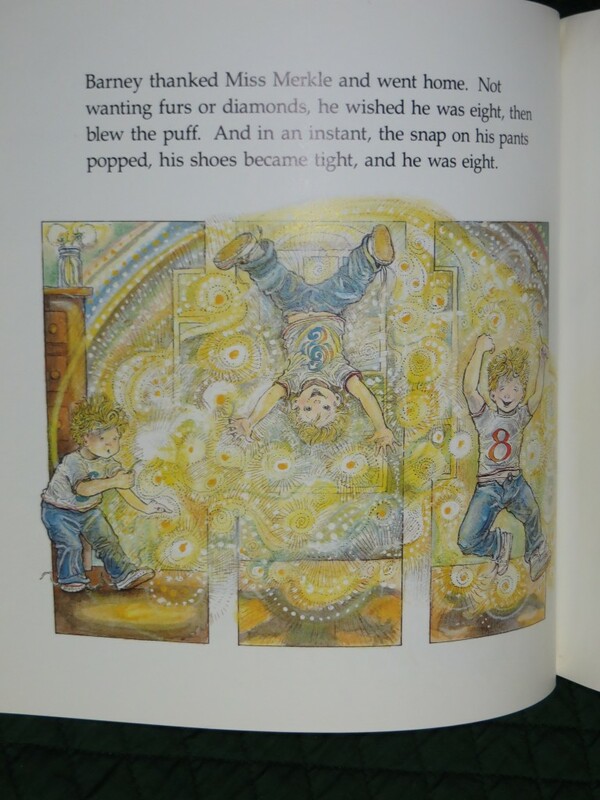 The boys love seeing how Barney’s wishes in action and suggesting ones of their own.